Welcome to NLP Magazine ! 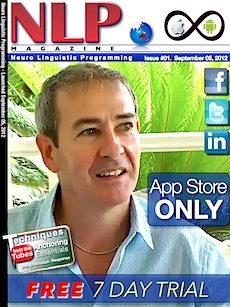 We’ve been LIVE on the App Store since 05 September 2012 and NLP Magazine continues to develop with every issue. Notable and respected experts from the global NLP community have contributed their knowledge and talents to bring NLP Magazine to life, and I am grateful to have received both their encouragement and support. Feedback is suggesting that not only is NLP Magazine a quality independent source of information about the industry, it is also creating a sense of unity among different facets of the field and helping to bring all NLPers closer together. With an increase of competition in the marketplace after 2000, the claims being made by some in order to attract business had become distorted and exaggerated, making it difficult for those curious about NLP to find genuine quality information without being misled or ‘pursuaded’ by some self proclaimed NLP expert out there blowing their own trumpet. The affect that such extraordinary claims had on the perception of the field displaced much of the real quality businesses and genuinely valuable information from the marketing spotlight. The role of NLP Magazine is to be a “difference that is making a difference” by colating and showcasing quality NLP from across the world and be a link between a growing global audience and the genuine leaders, trusted developers and respected practitioners in the field. NLP Magazine is truly independent, so readers get to discover all facets of NLP from virtually every area of the industry, and gain exposure to a global range of opinions, approaches and preferences, from those with demonstrated experience and knowledge. All this with maximum convenience right on your mobile device. NLP Magazine is big on visual presentation – it looks great, and every edition informs, entertains and educates not only throuh the articles authored by experts, but through the inclusion of beautiful, insightful videos live within the pages to maximise the enjoyment of your viewing experience. With meaningful, relevant content and openness to NEWS from all corners of the planet, I am sure you will love the experience of swiping through NLP Magazine on your device as you explore this truly international publication on the world of Neuro-Linguistic Programming, and discover even more about yourself along the way. Subscribe today and experience the convenience of having the world of NLP in your hand as each informative issue is delivered directly to your device. Check it out and let us know what you want to see more of. If you love it, please take a moment to let others know by leaving a rating or review on your app store. It’s just a small gesture, but it goes a long way.